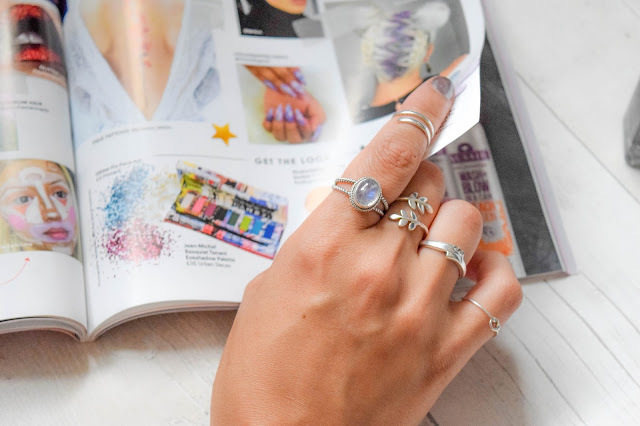 I love beautiful, simple silver jewellery and as you can see I have a little selection of favourites, but I love having a couple of statement rings too. 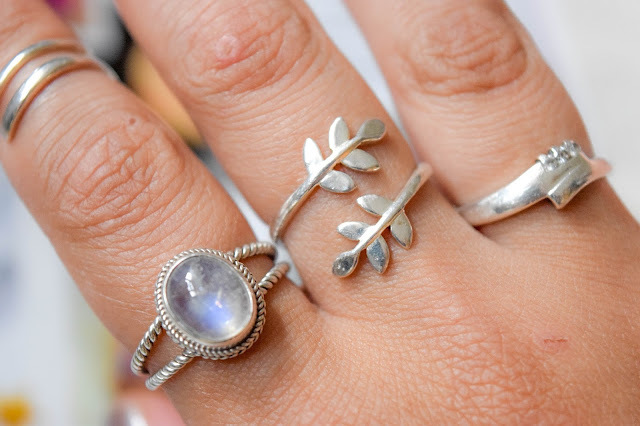 My recent addition to my ring collection is this beautiful Moonstone ring from MoonstoneMagic.com. 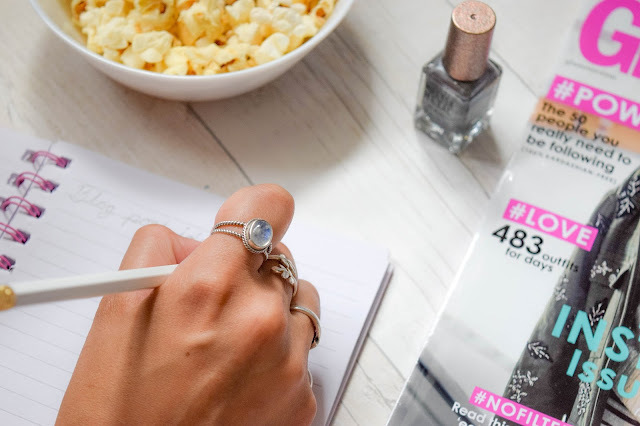 It's a gorgeous simple statement ring that I love so much I want to show it off a bit and tell you more about. So as I mentioned before the ring is from an online US brand called MoonstoneMagic.com. 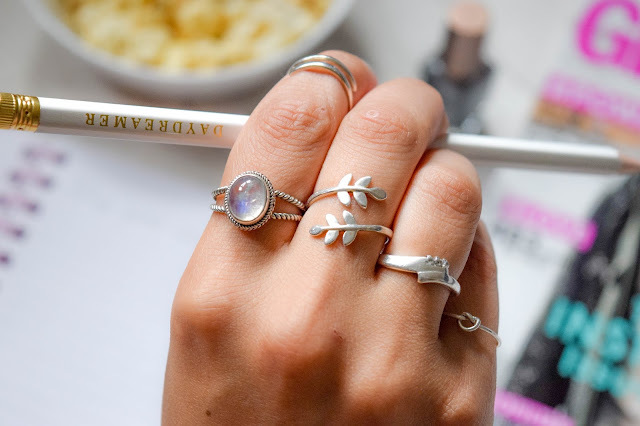 When I first discovered the brand I fell for their collection of rings thanks to their wide variety of unique styles. 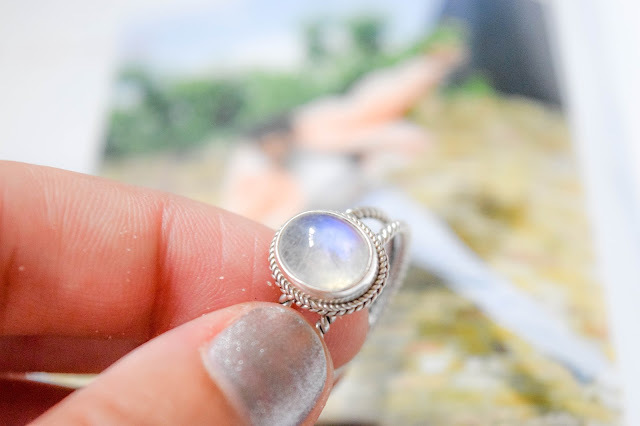 They have the simplest of rings all the way to the boldest statement rings, most of which feature this gorgeous moonstone which I can't get enough of. This one I'm wearing is called the Lynx Light and is said to "embody the powers of the moon". 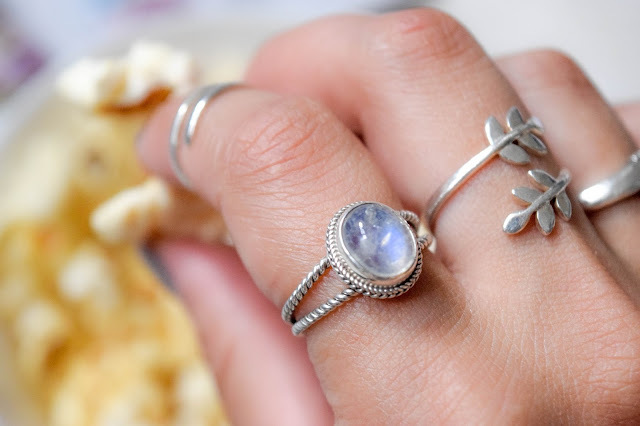 There is a whole section on their blog about what the meaning is behind moonstone which I thought was a lovely and interesting read you might be interested in too. 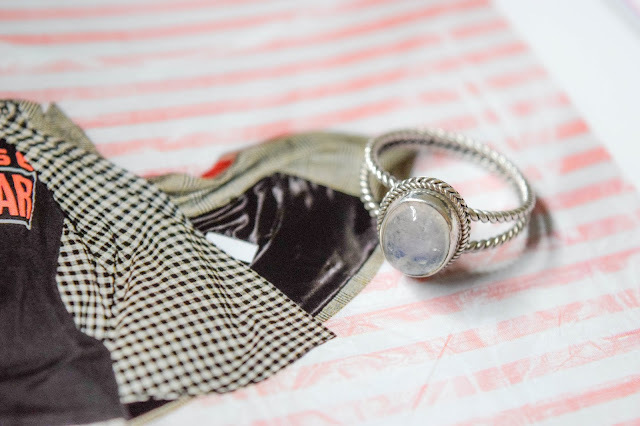 The ring is made from sterling silver and has been twisted and plaited into this beautiful design in which a genuine rainbow moonstone sits in. Almost all of MoonstoneMagic.com's jewellery is made from sterling silver and rainbow moonstone unless stated otherwise which I really love because I have a deep love for sterling silver jewellery and I love a light capturing stone like this one from time to time! The rings are made available in your standard ring sizes rather than being just one size or a S, M or L. I have quite large fingers I think so I got mine in a US size 9 because I wanted to make sure it fit my fore finger and middle finger best which is where I usually wear my statement rings. I've been wearing this ring every day for the past week now and I have to say, I'm still not over how beautiful it is. I catch myself looking at it and watching the colours dance in the stone from time to time and I'm very happy with the sizing as usually I'm quite off with my sizes and go too small (as I did with the one on my pinky). 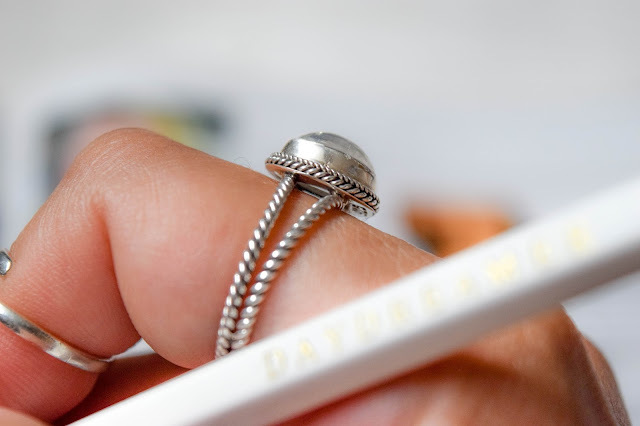 It sits well on my finger without being too loose or too tight. It's made really well too and I know this because the stone is well embedded into the ring and I can't see any way or any reason why the stone might fall out and the silver hasn't bent out at all. I often find that some rings - even if they are sterling silver - bend out of shape and ruin the look of the ring but there is no way of this happening here! It is made well enough that there is a slim chance of that happening. Aesthetics-wise, it sits well with my other rings I have too as they are all sterling silver, but the style isn't too far off the others too so they compliment each other well. It's just so pretty! Overall I really love my Lynx Light ring and wherever you are in the world - if you're looking for something unique and original, www.MoonstoneMagic.com might be the place you'd like to go for your next piece of jewellery. Delivery isn't that expensive (compared to other US postage I've seen and experienced) and the jewellery is a great price for genuine moonstone and sterling silver. I'd highly recommend at least taking a visit over to their website and following them on social media. You never know if they might come out with something new that you might love! 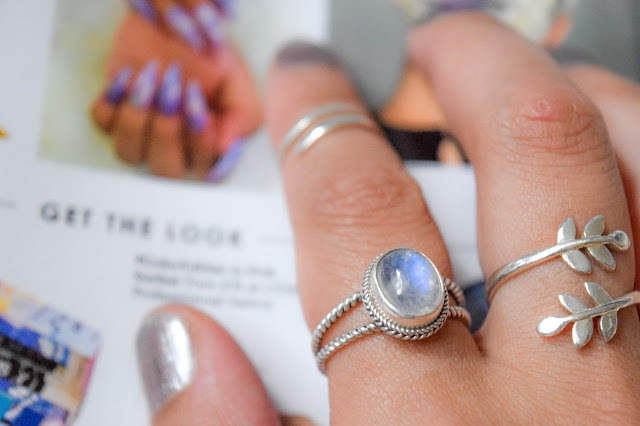 What do you think of the Lynx Light Moonstone ring? 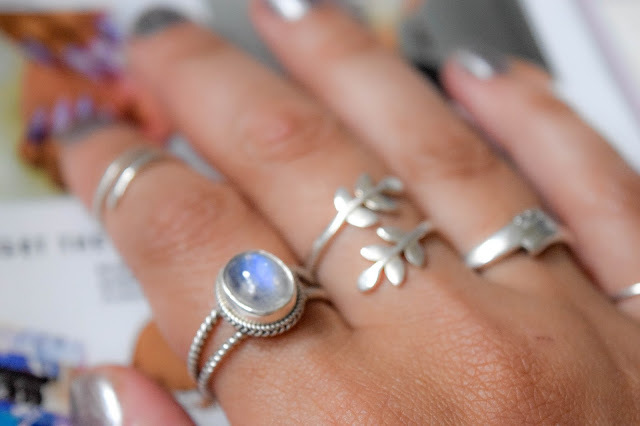 Will you be clicking over to their website to buy one of these moonstone rings for yourself?